With flavors of orange peel, Bourbon, and cheery, Grayton Beer Co.'s Dubbel Barrel is reminiscent of an Old Fashioned. One way to attract new consumers to beer is to take inspiration from cocktails. Pipeworks Brewing Co. in Chicago has been serving a rotating series of experimental beers that includes offerings modeled on classic cocktails, such as The Brown & Stirred ($11 a 22-ounce bottle), a strong brew that takes a page from the Longman Manhattan, a cocktail served at Chicago’s Longman & Eagle bar. The beers have enabled Pipeworks to attract non-beer drinkers into the beer space, says Kate Brankin, the brewery’s marketing director. Indeed, in numerous instances, brewers are collaborating with each other, teaming up with distilleries and partnering with bars to create riffs on classic cocktails that appeal to beer and spirits consumers alike. While some of the brews are available only in brewery taprooms, others have rolled out at retail, where they’re getting a warm response. Last year, St. Louis-based Perennial Artisan Ales teamed up with Creature Comforts Brewing Co. of Athens, Georgia on a tiki-inspired beer cocktail called Beachcomber, named after the legendary Los Angeles tiki bar Don the Beachcomber. Perennial brewer Chris Kinast sought out tropical flavors to create the draft saison, blending Mosaic hops, ginger, allspice and grapefruit purée. Beachcomber was offered in Perennial’s tasting room and at special Creature Comforts events. “Steeping the beer on hibiscus flowers provided a pink hue,” notes Kinast, adding that the brew was so popular he may produce it again. 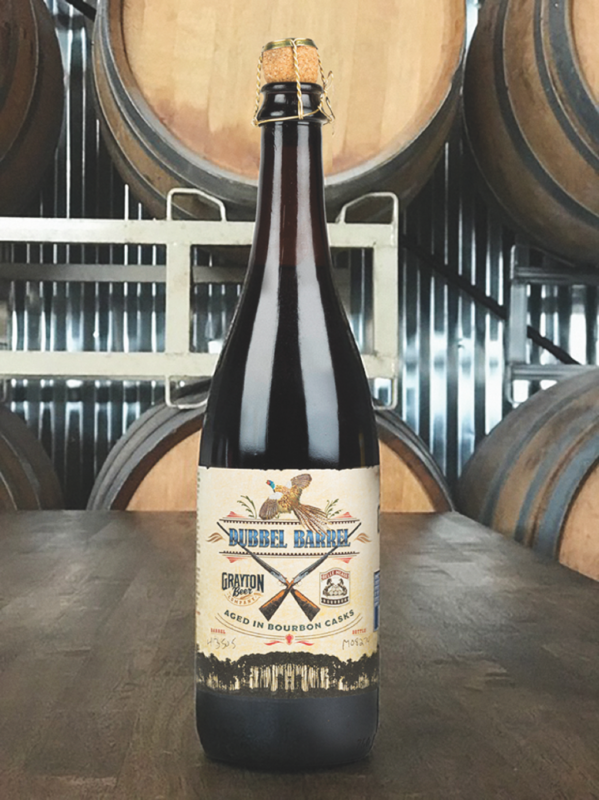 Grayton Beer Co. of Santa Rosa Beach, Florida, recently created the Dubbel Barrel—a Belgian-style dubbel fermented with orange peels and macerated cherries and aged in Bourbon barrels from Nashville, Tennessee-based Nelson’s Green Brier Distillery. The beer ($17-$130 a 750-ml.) takes on a spicy flavor that’s reminiscent of an Old Fashioned. “The Belgian dubbel style goes well with Bourbon,” explains Tyler White, head brewer at Grayton. The brew was only released as a limited edition in the fall of 2017, but response has been so strong it will be expanded into a seasonal offering. Brewers are collaborating with each other, teaming up with distilleries and partnering with bars to create riffs on classic cocktails that appeal to beer and spirits consumers alike. Pipeworks’ Brown & Stirred, introduced in 2014, was recently re-released, and the brewery has held tasting events at Longman & Eagle. Chad Hauge, beverage director at the Chicago bar, says the brew is served up over ice in an Old Fashioned glass, with a lemon twist, just like the cocktail that inspired it. Southern Tier Brewing of Lakewood, New York, has also made a beer that pays homage to the Manhattan. Produced with cherry juice, orange peel, and coriander and aged in Bourbon barrels, Manhattan ale was first released in 2016, and according to brand manager Nathan Arnone, demand has been so strong that the brew ($20 a 22-ounce bottle) is returning this year. He adds that the company is also developing an ale inspired by the Old Fashioned, incorporating herbs and fruit, under its Barrel House series. Arnone and other brewers say they’ve ventured into cocktail-inspired beers because they have deep respect for well-balanced drinks. “When crafting beer every day, we sometimes like to take a break and enjoy making a good cocktail with high-quality ingredients,” remarks Julia Cain, director of R&D brewing at San Diego’s Ballast Point Brewing Co. The brewery, owned by Constellation Brands, has produced a series of cocktail-inspired beers for its tasting room, including Moscow Mule ale. The Moscow Mule “was a favorite from the start,” Cain says. “Fans loved the lime, ginger, and balance of sweetness and bitterness.” In fact, the brew will be expanded into limited-release draft and 6-pack bottles next month. Producers of cocktail brews say the drinks entice both beer and spirits consumers. Matt Brophy, COO at Flying Dog Brewery in Frederick, Maryland, says that at the launch of the company’s Negroni IPA—part of its Sub Rosa series of brewery-exclusive releases—“about half of the people were Negroni drinkers and really excited to see how the beer played out, and the other half were people who just wanted to try a new IPA.” This year, Flying Dog will release additional cocktail-inspired beers, like Mimosa ale and Bloody Mary ale. Hauge of Longman & Eagle believes cocktail-inspired beers have staying power, noting, “The cocktail trend is continuing to grow while other categories have slowed a little, so it makes sense for brewers to draw from established flavor combinations found in cocktails.